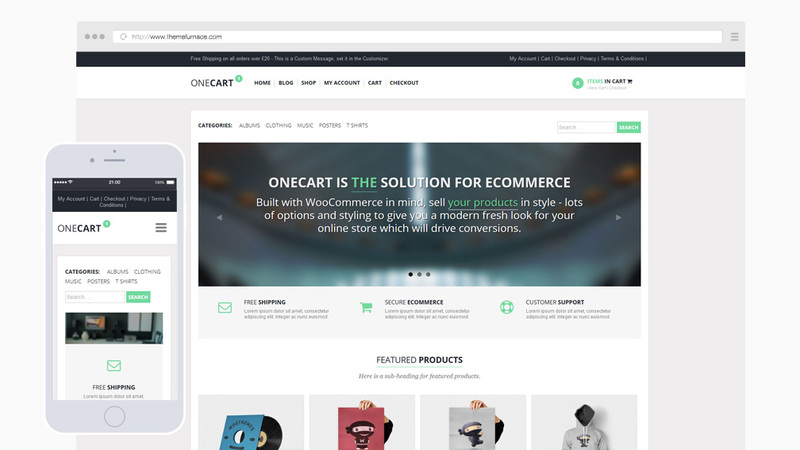 OneCart has a simple and clean layout which loads fast and displays your products in a well-designed environment – we strove for simplicity with this design: Visitors want to get to the products quickly and make their purchasing decision on well presented information with good quality photos. They need a seamless mobile experience as more online purchases are made on phones and tablets, OneCart scales down beautifully so you will never lose a sale because the user is on a mobile device. Includes easy to use slide-in menu for mobile devices, optional responsive flex slider with swipe gestures for touch screen devices, complete colorization options from the Customizer, Featured products and Latest Products for the homepage, credit and payment card icons, drop down shopping cart, 2 seperate feature icons areas, custom widgets for social media, advertising, Flickr photos, Dribbble shots, a welcome message in the top bar and 2 customisable menus.